I’m always flattered when the ladies in my apartment building invite me to join in their Mah Jongg game. They have each been playing for about a million years and their game play is fast and exciting. I like playing with them because it really sharpens my game play to have to play so fast. Their table rule is that you cannot lose more than $5 in one day so I come armed with lots and lots of quarters! 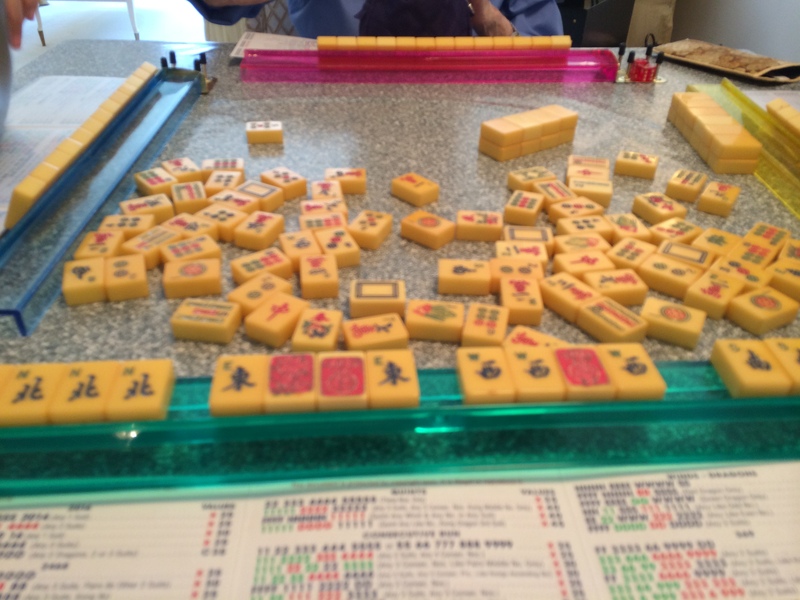 One of the ladies today has been playing Mah Jongg since 1938! She is in her 90s and still sharp at the game – wow! what an inspiration she is!! This hand came together nicely for me. I am finding the 2468 hands on the NMJL 2014 card much easier to play than they were on the 2013 card. Jean played this nice Winds hand several times today and won twice. Sorry for the blurry picture…don’t ask! I was so lucky on this hand – two One Dots were already discarded and I figured I didn’t have a prayer. But luck was on my side and I was able to exchange a tile for a Joker from another player’s exposure and then I picked a Joker…Mah Jongg! In the past I have played this hand incorrectly, not paying attention to the fact that it is made up of three different suits. 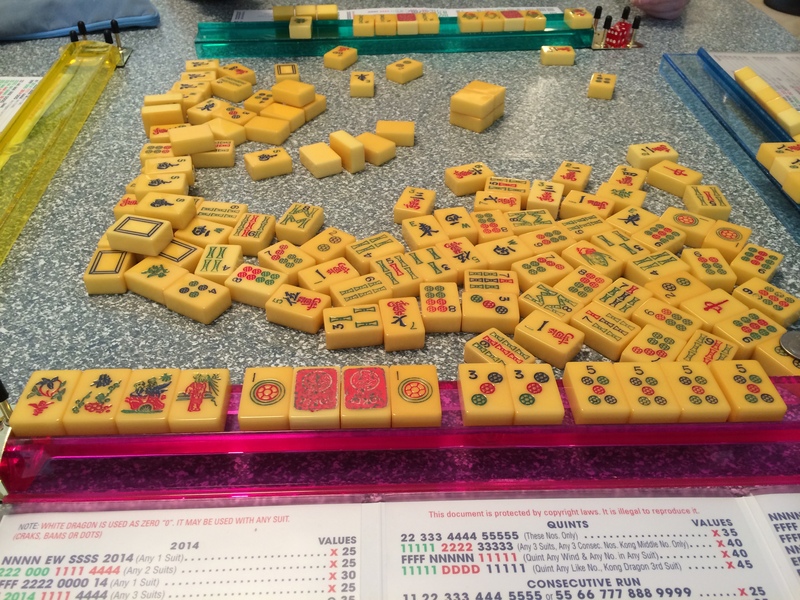 I have learned my lesson and now play it correctly – for Mah Jongg! Two South Wind tiles were already discarded and I was just waiting for someone to throw out another one when Adele declared Mah Jongg. I like this hand a lot and want to continue playing it whenever I can. 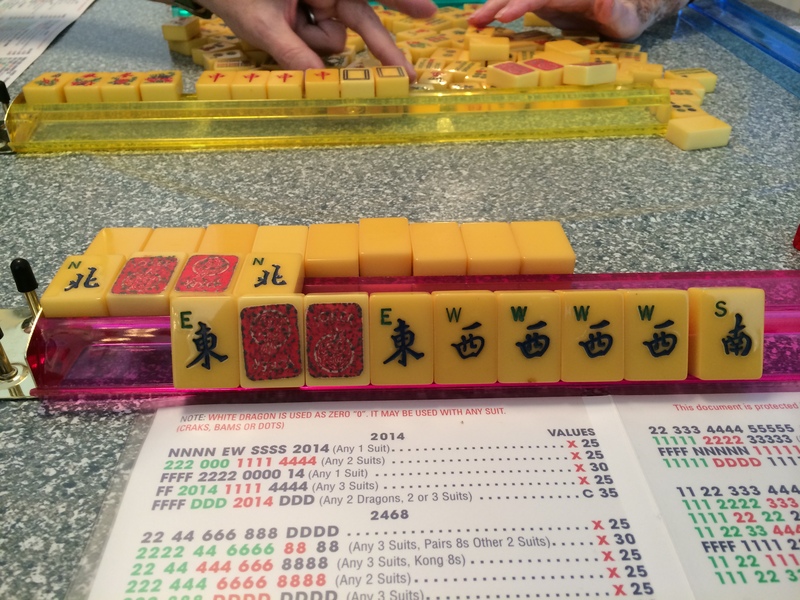 Adele declared Mah Jongg with this nice Like Numbers hand. I played a number of 2468 hands today and once again was able to declare Mah Jongg on this closed hand when Linda threw out a 4 Bam. Closed hands are nail-biters but are such great stealth hands since no one knows what you are playing. 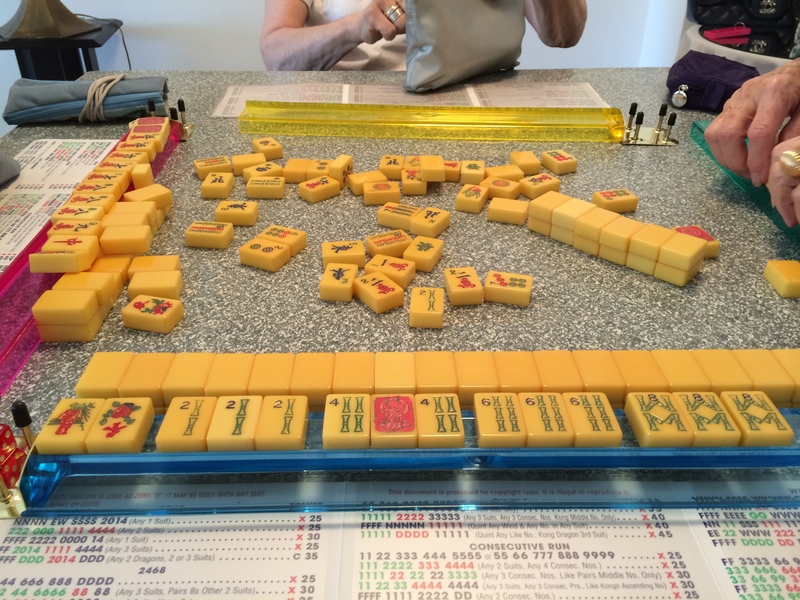 I do love a Mah Jongg Sunday – what a great way to end the weekend! 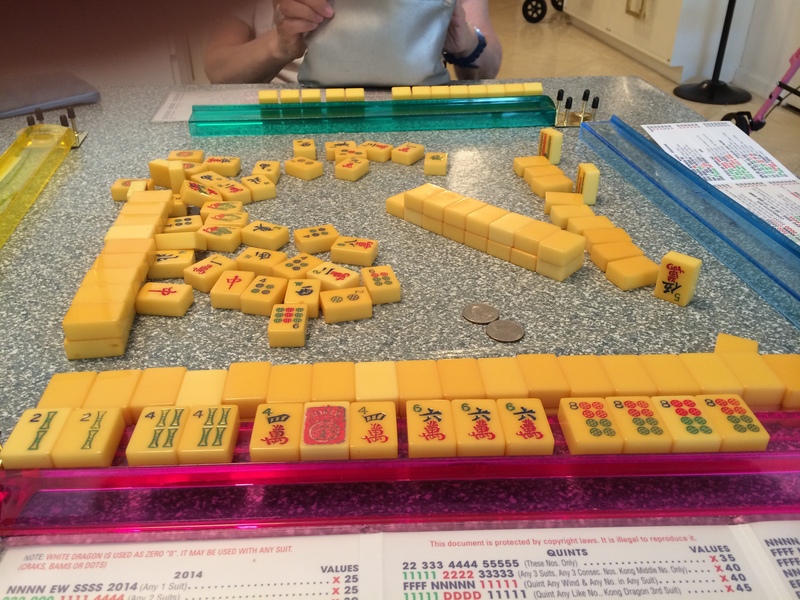 This entry was posted in Mah Jongg and Me and tagged 2014, apartment, building, Joker, mah jongg, nmjl, quarters, stealth, Sunday on June 2, 2014 by Mah Jongg and Me. Yes. Sometimes I just get an inspiration. Shows what a good photograph can do. Kudos to you for your photography. As an amateur photographer, I really appreciate your pix, not just snapshots, but good photography. I look forward to more! When you write that book you can use it as a caption for that picture. : ). Well, I would have loved to use your haiku in the book…unfortunately, it is at the publisher’s right now, going through its final printing and already on sale for pre-order on Amazon. It will come out on September 9th. Maybe for Volume 2…? 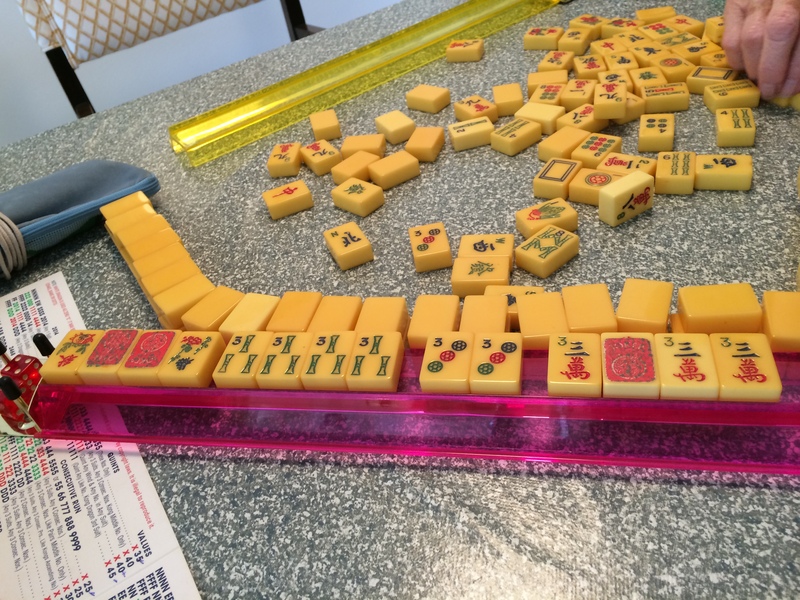 Love the idea of a Mah Jongg Sunday….or any day!! Re book: I mean your next book. Oh, yeah…volume 2 – someday…?! !